Windows let the light shine in while keeping the dirt and rain outside. While this is the primary function of windows, if the integrity of your window glazing is compromised, then you may experience many problems that could have been avoided with proper window waterproofing. Check below to learn more about the importance of window waterproofing. It is important to ensure your windows are properly sealed to keep your belongings dry and safe from the rain. If your window is not properly sealed, your property could result in water damage and could potentially have a mold from the dampness. Window waterproofing can help lower your monthly energy bill by reducing the heating and cooling of your building. Properly sealing your windows will also seal in your power, stopping the clean air from seeping through the cracks of your window and vice versa. Since insects are attracted to water and like to enter buildings through small cracks and crevices, it is a good idea to waterproof your windows to ensure there are no open cracks for creatures to enter after a storm. Look to Shield Coatings & Weatherproofing to improve the safety of your building and the overall comfort of your space with our window waterproofing. If you are interested in learning more about our waterproofing or commercial roof repair in Florida, contact us today at (813)247-5421. This entry was posted in Uncategorized and tagged commercial roof repair Florida on November 21, 2017 by 18015942. At Shield Coatings & Weatherproofing, we strive to protect your buildings by offering affordable wall weatherproofing services. Our specialty seals and coatings add value to your property and protect your walls from water intrusion and damage. Although we help enhance your walls by weatherproofing, we have seen our fair share of cool walls designs. Check below to learn some fun ideas to incorporate into your commercial building to attract attention. Argyle- Add a geometrical pattern of diamonds, otherwise known as Argyle to your walls to create a fun statement. Mural- Create a painting of a scene or a saying on the side of your building to attract customers. Murals are becoming a popular attraction for people to pose in front of for their social media efforts. Stripes- Enhance your building’s aesthetic with vertical or horizontal stripes. Add a fun color combination to make your building stand out from the rest. Mosaic Tile- Create a fun assortment of tile to add pizzazz to your walls. You could construct an image out of the tiles or have a unique and random selection. 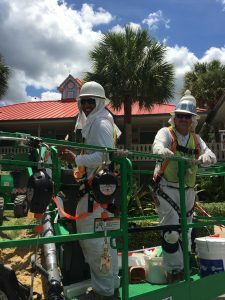 Whether you need to weatherproof the decorated walls of your business or you are interested in our commercial roofing in Orlando, FL, our dedicated staff can help you get the job done. Contact us today at (813) 247-5421 to learn more about our weatherproofing products. This entry was posted in Uncategorized and tagged commercial roofing orlando fl on November 14, 2017 by 18015942. Many companies, such as restaurants, incorporate outdoor decks in their business plan to enhance the overall environment and culture. At Shield Coatings & Weatherproofing, we strive to help our commercial clients succeed in business keeping their buildings safe from water damage. Below we have the many benefits of weatherproofing your outdoor deck. Preservation of Property– Weatherproofing your deck is vital to protecting your property. Water intrusion can seep into the cracks and erode your deck, causing damage to the interior and exterior construction. This could cause an interruption of the functionality of your commercial deck, resulting in a loss of sales. Prevents Accidents– Since decks require constant foot traffic, it is imperative to weatherproof your deck with our specialty coatings and masonry repair services to help to avoid accidents with your customers and employees. Longer Lasting– Add value to your deck when you entrust our weatherproofing services. Our coatings allow your floor to withstand harsh weather while prolonging the overall life of your surface. Prevents Mold- With any water intrusion, you face the threat of a mold growth. Help prevent the growth of mold and fungi with our weatherproofing seals and coatings. 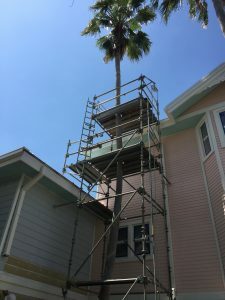 Whether you are looking to have your deck weatherproofed or needing a commercial roof repair in Florida, we can get the job done. Contact us today at (813) 247-5421 to learn more about our services. This entry was posted in Uncategorized and tagged commercial roof repair Florida on November 7, 2017 by 18015942. With fall in the air and winter around the corner, the weatherproofing specialists at Shield Coatings & Weatherproofing strive to help our clients get the most out of their skylights and windows during the colder months. Below we have helpful tips for your skylight maintenance that is best performed in the fall. Similar to windows, skylights are an essential design element to your space that adds functionality by increasing your natural lighting. It is important to properly clean your skylights to ensure you receive the most out of your investment. We suggest cleaning your skylights during the fall while the weather is not too hot but not too cold. It is important to have regular maintenance checks on your skylights to check for cracks from fallen branches, rocks, birds, and any other extreme impacts that could cause breakage. If you are interested in learning more about our skylight waterproofing services, contact us today at (813) 247-5421. This entry was posted in Uncategorized and tagged skylight waterproofing on November 3, 2017 by 18015942. Fredi and Noé. Long-time members of our team. This entry was posted in Uncategorized on June 26, 2017 by 18015942. Here’s a great example of SC&W watching out for the safety of its employees, as well as the environment we all share.